Visiting Ian (VK3MO) at his home in Kyneton Victoria and witnessing the completion of his new 60metre tower. Twice in the last month I have had the pleasure of meeting Ian Williams VK3MO and his family whom as it turns out is a cousin of my wife. Small world! 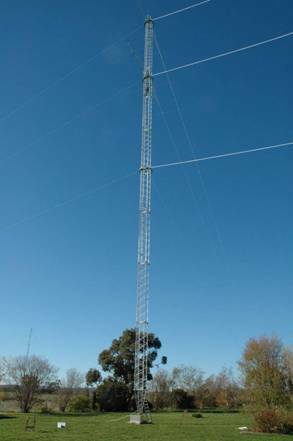 As many in the amateur radio community know, Ian is major player in the 20 metre band DX seen and operated one of the worlds leading antenna systems in Kyneton. Unfortunately the antenna systems including the famous rotatable mast and its four stacked cubical quad antennas were destroyed by an uncharacteristic serve storm. 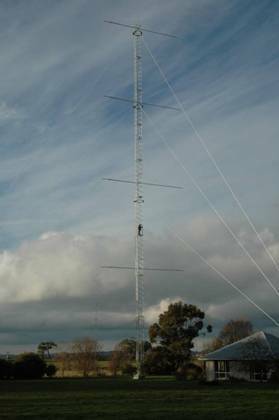 My first visit in late May 2007 coincided with installation of the second of the four, five element 20metre band mono-band yagi antennas on the newly replaced 60metre (200') rotatable mast. This is the most impressive amateur radio antenna system I have ever seen and that includes the internet! The first of the below photos is Ian preparing to climb the mast to attach the yagi. 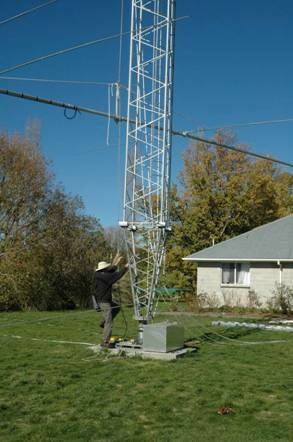 The antenna is being hauled into position by a rope with pulleys at the top and bottom of the mast which is attached to a truck in the next paddock being operated by John VK3VN. The second of the photos is yours truly (That would be the red pixel just below the second yagi) at the 150 foot level. At this time my wife, Colleen yelled up that it was time to go! I responded just give me fifteen minutes to climb down. Oddly enough with the ladder on the inside of the tower I did not feel overly height exposed and it only took a short while to feel comfortable and move around and well enjoy the view! Ian works fast and by my second visit two weeks later all the antennae were installed and he was well into installing the cabling. The below group of photos show the complete installation with a house for scale. The guy cables are Kevlar as steel wire even with sectionalising insulators would distort the ideal radiation pattern of the yagi antennas. The guys are secured to sections of railway track concreted 3 metres into the ground. The antenna switching system results in any one of the Yagi antennas being operated as a single antenna or they can be operated as a phased array. The effect of the ground on the various yagi antennas results in a slightly differing take off angle for each antenna and this may at times manifest its self as multi-path distortion for the receiving station. But when using a single yagi there is the opportunity to select the antenna with the optimum take off angle of radiation to target a particular station or location in the world. 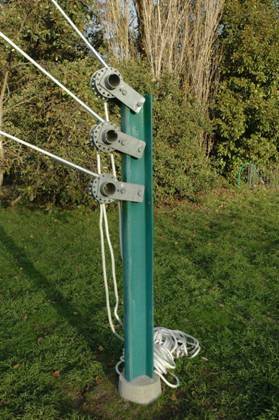 The mast is designed to be self supporting. This means that the mast could have been assembled on the ground and then lifted into position. For economic reasons the first half of the mast was lifted into position by local crane operator and the final half of the mast was lifted into position by a large 200' crane brought in from Melbourne . Antenna switching: Each antenna can be switched in separately or all four can be feed in phase. 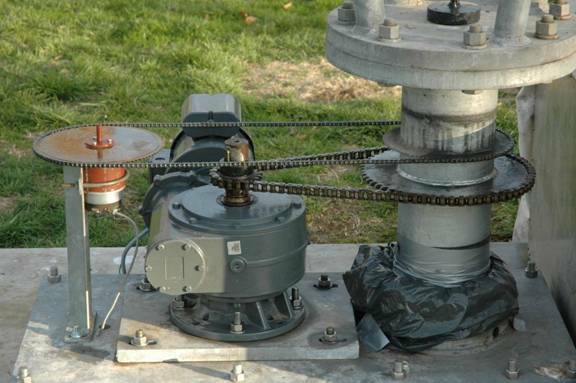 Rotator motor: 240VAC, single phase 3/4 Horse with a double worm gear box. Antenna mast can rotate 360 degrees in about a minute. Mast guys are 14mm diameter Kevlar with a polyester jacket to provide UV protection. Breaking load is 8000kg with low stretch. Yagi antennas were designed for optimum performance using EZNEC Pro Software. Total Array gain is 20dBi @ 6.1 degrees. The vertical beam width is 7 degrees with -3dB points of 3degrees and 10 degrees. As I say, Ian works fast and the last report I got was that as of Monday (11/06/2007) it is all connected and seems to performing well with good VSWR for all antenna combinations. stacked beams knows that output power is not everything. .... he's usually S9 on whatever power he's using... the answer lies in the antenna., as we all know. Ian's antenna system is a truly impressive engineering achievement.